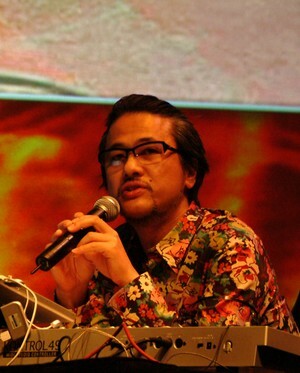 Masaya Matsuura is a member of the Academy of Interactive Arts & Sciences. He spoke at the D.I.C.E. Summit® in 2008 and the D.I.C.E. Summit® Asia in 2009. He works for NanaOn-Sha. A: By the number of people who felt happiness through my creations. A: Making totally new experiences into something tangible. Naturally a great effort from the development team is essential. In addition, there is a moment in development (usually later in the cycle) where the game finally becomes fun. A lot of developers say that this is the moment when a new experience is born, although I'm unable to properly put the sensation into words. A: I never feel that way with either games or music. A: Reducing the volume of games that involve hurting people with knives and guns. The recent success of music games and also family games for the Wii springs to mind. Undoubtedly there are other possibilities out there that are as yet undiscovered. A: We are working on a project providing a music game which has high playability despite being for cell phones. I'm really enjoying this interesting project and have high expectations for it. A: I’ve been thinking about peripheral-based games these days. It is great that they’ve gotten really popular but I'm concerned about people throwing them out after the boom subsides. On the other hand it is true that games need to have more tangible experiences. I have a toy piano which is not special at all but it’s precious to me. There is no doubt that it’s just a toy and no matter how hard I practice it’s impossible for me to deeply express myself musically with it but despite that I probably wouldn't let it go. I want all games and peripherals to be cherished this way. A: Games are very important in order for human beings to expand the possibilities of expressions. A: Globalizing the industry without slowing down. Game creators need to wrestle with the necessity to market their games globally. Thanks to the internet we are living in an age of borderless information exchange. Music and film are adapting to this, trying to find new forms of expression. Should games continue to focus their content regionally then naturally we won't compare favorably to these other forms of entertainment. Of course, international events such as DICE Asia help in this respect. A: I have no idea about that but without doubt the amount of time I have to play games is decreasing. Q: Finally, when you look at the future is there one great big trend that affects everyone? A: Games will one day cease to be contained inside physical screens. I believe that someday a new form of media will emerge and take the world by storm. It may not to be called “games” any more despite sharing some similar characteristics. It could possibly be something which is merged with other forms of existing media.